Chartist Ancestors Blog: Was the 1842 Chartist petition really six miles long? 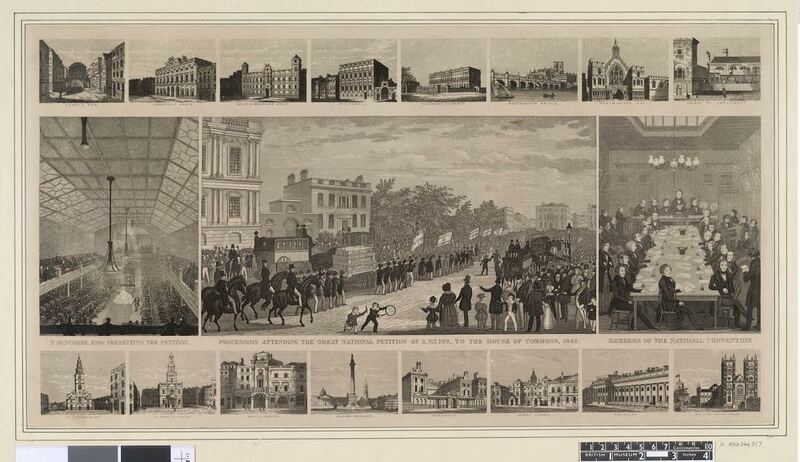 The presentation of the second Chartist petition to Parliament in 1842 makes for a dramatic story. As told by Feargus O’Connor and the Northern Star (NS, 7 May 1842), the petition with its 3,315,752 names was six miles long, weighed 6cwt, requiring it to be carried by 30 strong men, and on reaching the House of Commons, the doors had to be removed for it to fit in to the Chamber. But how true was all this? O’Connor was often stronger on oratory than detail and his later claim of 6 million signatories to the third petition was dismissed not only by his enemies but by leading members of the National Charter Association. Did O’Connor embellish the truth? As far as I know, no one has previously done the maths – so I thought I would give it a go. First the length of the petition: six miles (that is 380,160 inches) of paper would have allowed only around one-eighth of an inch depth on the petition form for each signature, which seems much too tight. However, the Star had previously reported that the forms were printed to allow for four columns of names (NS, 6 November 1841), meaning that the petition had space for 2.2 names per column inch (roughly one for each column cm) – which sounds reasonable. Indeed, at that density, if laid out one below the other the signatures would have run not to six but to 24 miles. As to the weight, that too seems realistic. Each man’s share of the 6cwt (305kg) burden would have been 10kg – an easy load for most people, and quite manageable for a working man to carry over the circuitous processional route, at least three miles long, from Lincoln’s Inn Fields via Oxford Circus to the Palace of Westminster. But could the petition really have become stuck in the doorway? This is widely attested but difficult to verify. We know that following the fire that had destroyed the Palace of Westminster in 1834, the Commons was meeting at the time in “temporary accommodation constructed within the ruins of the old Palace" (Victorian Commons blog, accessed 1 June 2016). So it is quite possible that the entrance was narrower than the wide double doors leading in to the modern chamber. A standard internal door today is 30 inches wide (76cm) while a Victorian front door was around 36 inches (90cm). Assuming that the wooden frame housing the petition added around eight inches to the width of the petition (the contemporary picture of it below, published by the Northern Star, suggests the box-like structure would easily have done that), the paperwork itself would have to be somewhere between 22 and 28 inches in width for the whole thing to become wedged. Unfortunately, no copies of the petition survive, but as the forms were printed by the publisher of the Northern Star, they could well have come from the same stock of paper (NS, 6 November 1841). I have not been able to check the physical dimensions of the Northern Star at that time, but a standard broadsheet newspaper is printed on paper 23.5 inches wide – which is certainly in the correct range for this claim too to have been true. Update: On reflection I wonder whether the petition and its container were actually somewhat larger than I have allowed for and heavier than the Northern Star suggested. The petition forms were printed to give space for 200 signatures each. That means a minimum of 16,580 sheets were needed. But since many forms must have been incomplete, a round figure of 20,000 is reasonable – a total of 40 reams of paper. Taking modern photocopier paper as a rough benchmark, 40 reams stacked one on top of the other would stand 80 inches (203cm) high – which would clearly be impractical to carry and is not what the picture shows. More realistically, the pages would be stacked in three columns, with the wide edge of the paper (29.5 inches of standard broadsheet) forming the leading and trailing edges. Loose paper takes up more space than machine-packed unopened packets, and so the pile would probably have stood around 36 inches (91cm) high, with a breadth of 29.5 inches (151 cm) and a total length of some 70 inches (178 cm). This would then all have to fit inside the wooden frame – quite likely a misnomer since nothing short of a fairly stout box or casket could have contained the vast quantity of paper and been strong enough to be carried to Parliament. Allowing some space on all sides of the petition sheets as these would have been difficult to keep neat and flat, often having been touted around pubs and front doors, folded into pockets then posted back to London, this could easily have added around 8 inches to each dimension, giving an overall height of 44 inches (112cm), breadth of 37.5 inches (95cm) and length of 78 inches (198 cm). Interestingly, this is almost exactly how the petition appears in the picture. Such a large box, however, must have added considerably to the weight, and it is difficult to imagine that the whole load – box and petition included – could have come in at as little as 305kg. Maybe this was the weight for the paperwork alone. It would be fascinating to carry out an experimental history project, attempting to re-create the box and fill it with 20,000 reams of newsprint. Alas, I think the carpentry skills are beyond me. So all in all, yes, it does appear as though the story is true. What a day that must have been. The procession of the 1842 petition to Parliament. In the left panel, Thomas Slingsby Duncombe addresses the House of Commons, while the centre panel shows the petition in its wooden frame. ©Trustees of the British Museum.